In May 1872, the first railcar crossed the Cumberland River on a suspension bridge that also serviced the Fatherland-Shelby line. One car left the terminus every fifteen minutes with a fare of 5 cents. Street railroads such as these contributed to the nation-wide trend of urban dwellers relocating to less-dense suburbs. 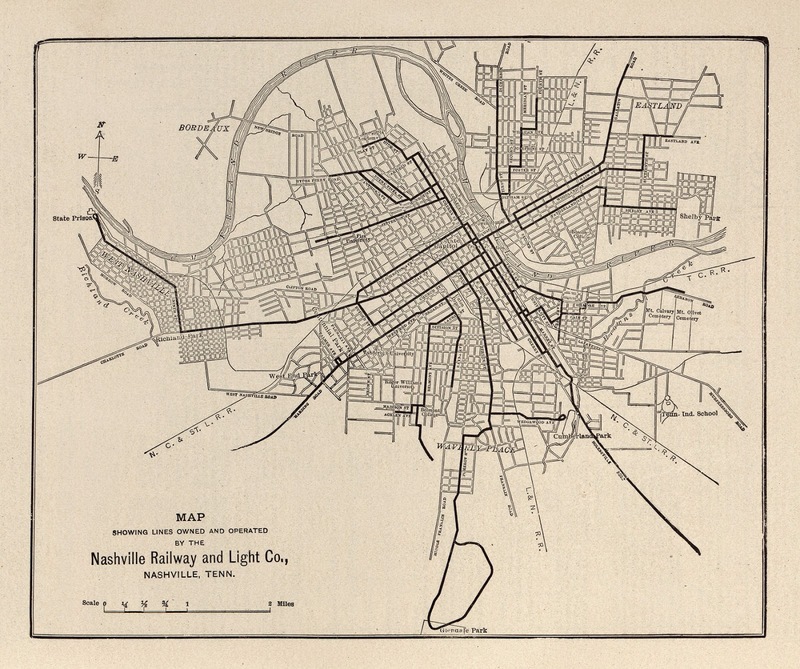 The Nashville and Edgefield Street Railroad Company allowed other street railroad companies to use their lines. For $5 per car per month, any other railroad company could run their cars across Nashville and Edgefield Street Railroad Company lines as long as they did not interfere with the regularly scheduled cars of the Nashville and Edgefield Street Railroad Company. In the time of street railroads, steam ferries, and cable cars, suburbs popped up outside of major cities all across the world, including New York, Chicago, and London. Edgefield grew up in this age of commuter suburbs. Austin Hall, “Fatherland-Shelby Street Railroad Line,” Bygone Nashville, accessed April 25, 2019, https://bygone-nashville.mtsu.edu/items/show/41. “Edgefield.” <em>Republican Banner</em>[Nashville] 22 March 1874: 4. Print. Riley, Mark B. “Edgefield: A Study of an Early Nashville Suburb.” <em>Tennessee Historical Quarterly</em>, vol. 37, no. 2, 1978, pp. 133–154. JSTOR, JSTOR, www.jstor.org/stable/42628319. Jackson, Kenneth T. <em>Crabgrass Frontier: the Suburbanization of America</em>, Oxford University Press, 1985.